You'd think any fast-food chain would have taken a lesson from KFC and the Great Free Chicken Fiasco of 2009 and avoid offering customers an outrageous deal via the Internet, where word of just about anything -- good or bad -- can spread faster than greased lightning. 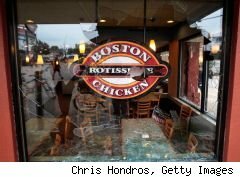 Nevertheless, Boston Market stepped into similar pile of fowl doo-doo last week when it offered its loyal customers a coupon for a $1 chicken entree via its Web site. While not free, it was still one hen of a deal. For $1, diners got a choice of a quarter white or 3-piece dark chicken dinner, along with mashed potatoes and cornbread. Vegetables weren't part of the deal. Apparently, the week-long promotion was too good for recession-weary consumers to pass up and resulted in shortages of chicken at many Boston Market restaurants, including one in Florida, where a sign pleaded with customers to limit coupon usage to one per person. Some of its restaurants were limiting coupon users to meatloaf or turkey, while saving the chicken for full-paying customers. An e-mail sent to company headquarters in Golden, Colo., and a call placed to a Boston Market marketing representative inquiring about the shortages and the offer weren't immediately responded to. Folks at Boston Market, it seems, weren't paying attention (or maybe they're just not fans of Oprah) to the hoards of reports about KFC restaurants running out of chicken when, in May, legions of eager finger-lickers downloaded a coupon, at Oprah Winfrey's invitation, for two free pieces of its new Kentucky Grilled Chicken. The subsequent fallout has become a textbook example of how not to go about marketing a new product. Boston Market's promotion was concocted as a response to KFC's "UnFry Day," which took another stab at offering the public a free piece of grilled chicken on Oct. 26. As with the KFC promotion, Boston Market's coupon, intended for customers of its VIP Club, spread to other deal sites. As more people sought to cash in on the deal, lines formed and the Boston Market chicken meals became scarcer than ham-and-cheese sandwiches at a Bar Mitzvah. Boston Market's coupon, which expired Sunday, has been removed from its site but can still be found floating around the Internet. Just keep in mind that at this point, it's as useless as a chicken with its head cut off.